New Delhi, August 1, 2016: Panasonic India today launched an innovative design based, dual 2.5D curved glass and metal body smartphone, the ELUGA Arc2 is available at a best buy price of Rs12,290. Panasonic, a leader in technology innovation, designed the device using minimal plastic material for a great visual appeal and offers strength to withstand rigour of daily usage. The ELUGA Arc2 comes with 7.6mm thin metal moulded body made with aircraft grade aluminium alloy using CNC technology, giving a glittering look to the device. The Front & Back are finished with 2.5D curved Asahi Dragontrail™ glass for an elegant look, and is scratch resistance. The device is lightweight at only 147 gm. The ELUGA Arc2 sports a 5 Inch HD IPS Display topped with a 2.5D curved Asahi Dragontrail™ glass in the front with On-Cell Touch technology for a fluid touch experience. The Outdoor-Pro Display of the device features up to 500nit brightness for great outdoor readability.The stylish device comes with 8 MP rear camera with LED flash and 5 MP front camera for capturing the perfect moments and selfie. Appealing to on-the-go professionals, the ELUGA Arc2 comes with Android 6.0 (Marshmallow) with Android-For-Work functionality for enhanced security & BYOD usage. It is powered by a 1.3 GHz Quad Core processor supported by 3 GB RAM and 32 GB Internal memory, expandable up to 128 GB by using a SD memory card. It comes loaded with 4G VoLTE Hybrid dual SIM configuration and a battery capacity of 2450 mAh. The device features support for USB On-the-Go (OTG), and features Panasonic’s new Turbo download feature – which combines Wi-Fi and Data for quicker download. 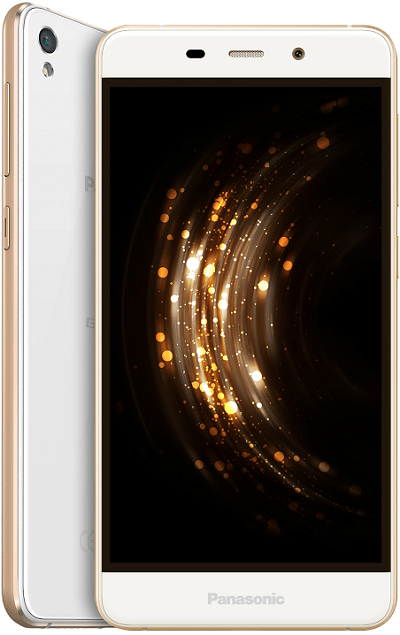 ELUGA Arc2 is available in two colours – gold, and rose gold. And adding to the surprise element, it also comes with a protective screen guard. INBOX ACCESSORIES Device inclusive of Battery & Protective Screen Guard on front/back glass, USB Cable, Charger, Earphones, Warranty Card, User Manual & SIM insert pin.